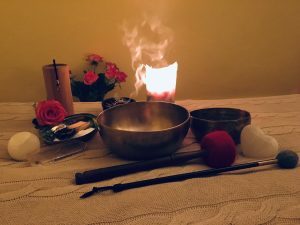 This meeting/therapy/massage is about reconnecting to your true essence and clearing away stress and confusion. 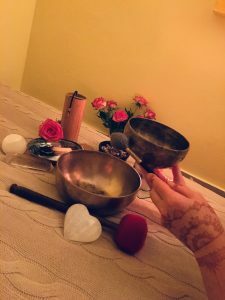 Using the ancient techniques of breathing, deep relaxation, fumigation, unique essential oils, pomanders and Tibetan singing bowls and Koshi chimes we will renew your wellness and joy. Young Living Essential Oils are Gifts of Mother Earth – therapeutic-grade oils, aromatic, concentrated plant extracts that are carefully obtained through steam distillation, cold pressing or resin tapping. Pomanders Aura-Soma work within the electro-magnetic field surrounding the physical body to essentially help protect, cleanse, refresh and strengthening the energetic field around you. Every pomander contain the energies of herbs, colour and crystals. Ritual of burning sage and Palo Santo belongs to oldest and purest methods of energetic cleansing a person, or space. 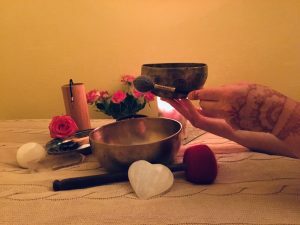 Tibetan singing bowls can generate a type of energy vibration to help you to reduce stress, heal pain or depression and create a deep sense of peace, well-being and better health. Koshi chimes are authentic musical instruments from Pyrenean Mountains with crystalline relaxing sound. It´s only on you, how much relax you will allow, how much you will enjoy. I will guide you through the therapy with all my respect and love.